Along the way I have passed a number of Monsun boats. Most of the boats I have seen in real life where in very good conditions, judging from the looks of the hulls and rigging. It is always kind of a special moment to see another Monsun sailing. All of the ones I have seen are personalized, yet still Monsuns. 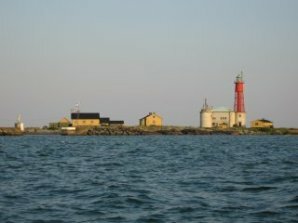 One such occasion was when I sailed out to the most southeastern Swedish island of Utklippan to do some seal spotting with my daughter. We were out there late September, and days had become short. Moored inside the inner well-protected harbor on the island, we had gone ashore to take pictures and enjoy the wildlife. As we were getting ready to leave in the evening, another Monsun comes from east, lit up by the sun that was just about to tip behind the horizon in the west. It had a German flag and carried father and son who were on their way home to Germany from a trip to Sweden. Moments like this are so nice that I have started to think about where all the Monsun boats have ended up after 30-40 years of floating about. Obviously, many were still in Sweden, but some also had been bought by owners very far away from the shipyard on Orust. 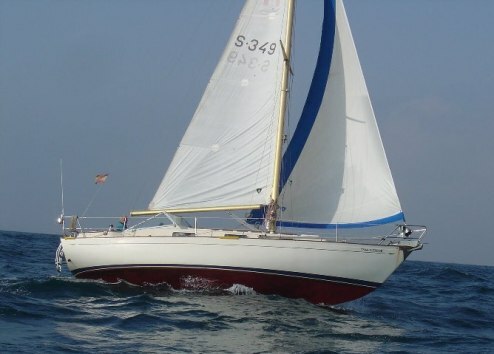 Then, as I started scouring the Internet about Monsun information for a while back I found out that many owners are in contact with other owners, and the exchange of technical innovations and ideas about sailing techniques with this special vessel was abundant. So I thought that it would be cool to provide all the Monsun owners with a platform for a connection, the Monsun ships listing. So with some decent skills in SQL, database management, and PHP I put together the initial list. Then, of course it had to have some content in it to begin with. A good start was the Danish Monsun Club that had a listing of the member ships in their member section. I copied that into the list. Then I also am a member of the Swedish Cruising Association SXK. There were over 100 member boats listed, that I copied into the list. From Hallberg-Rassy Shipyard I heard that many boats had been sold to Sweden, Germany and Denmark. So I had to fix some pages on the web to catch the attention of German owners as well. I know that a few German boats sail in the Netherlands. And then I got so many nice responses from all kinds off people on the list, that I find it worthwhile to put it out to the Internet community. A fun experience to pass another Monsun! 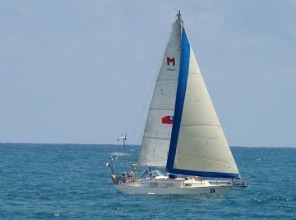 Here is NADA #349 owned by Pablo in Spain. I have email-addresses of many Monsun owners, but do not want to put them on the public side of the database. But in case you, as a Monsun owner have questions to a specific other Monsun owner, please drop me a mail, and I will forward it to the person in question. I will on request post messages and links to other Monsun owner bloggs on this site. When I had just bought Isabell, and she was still moored in the port of Hinsholmskilen in Gothenburg, I met an older Swedish gentleman named Lars. 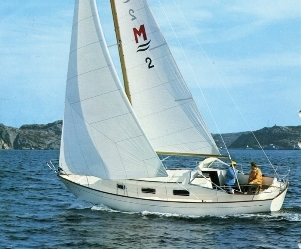 He told me that Isabell was one of the last Monsuns built by Hallberg-Rassy. He had worked at HR earlier, and knew a lot about Monsuns. And I heard from Christoph Rassy, the former HR owner, that the company records were a bit unclear about the exact models of HR boats that were built during the early half of 1980's. All the records were kept on paper, and many did not have model typed on them. Lars told me that the model to succeed Monsun, model HR312, was started in 1979, taking over the market quickly. As it was uncertain how many were Monsuns and how many actually were 312 models, he said that about 820 Monsuns were built for sure, but not more. Now, when looking at the highest numbers of Monsun hulls in the Registry list, I tend to believe Lars. It is most likely so that not many Monsuns actually were built after 1980. And then, Isabell is one of the last ones made as a real Monsun.